Hi, Guys Do you want to Irritate/Disturb or Annoy your Friend for any Reason. If yes then this Post is for you. With the below given SMS Bomber Online or SMS Flooder, You can Send Unlimited Amount of SMS to your Friend’s Mobile Number and make him Disturbed using the simple trick given below. 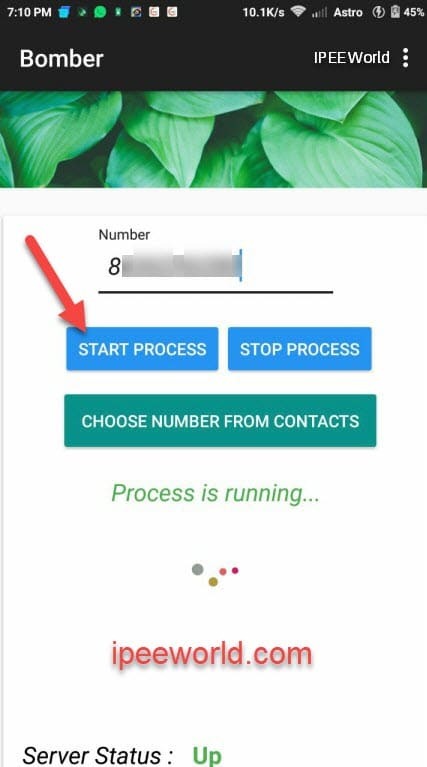 All you need is just enter the Mobile Number below, and rest will be intelligently automated. New SMS Bomber APK Method also added! The Text Bomber mentioned below works well with all country including the United States and the UK, Etc, So it has international support. 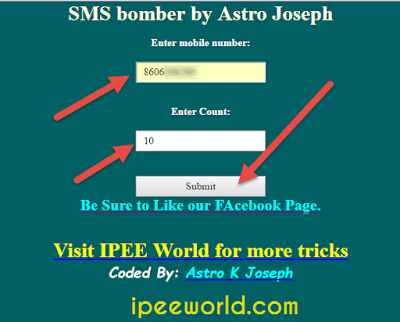 A Script Developed exclusively by IPEE World allows you to Send Unlimited FREE SMS to your Friend by entering His/Her Number on our Online SMS Bomber Script or Website. Similarly, you can also irritate your Friend on WhatsApp by Crashing it also This is 100% Safe and Easy. There are some specialties that make our script different from others, they are: This SMS Flooder will work even if DND or Do Not Disturb service is activated on the Mobile Number. A majority of the users will have enabled DND on his/her phone, So it will work even if DND is active. Works with all operator and service provider as well. Also be sure to check some Cool WhatsApp DP and GBWhatsApp Direct Link as well. There are many Online websites claiming SMS Flooder Online and Text Bomber, but all of them won’t work, Now we are here with one of the Best SMS Flooder/Bomber which you can use for FREE.You are not required to Download any App or APK. Privacy is a number one concern for us. We do not store any data regarding the Mobile Number on our server or Website. Furthermore, we do not send any unwanted SMS after you have done SMS Bombing. So using the SMS Bomber Script below is 100% safe and secure. can safely use this Trick. Another Interesting part of this Bomber Site is that This Script will work if DND is activated on your Friend’s Mobile. Isn’t that Cool! 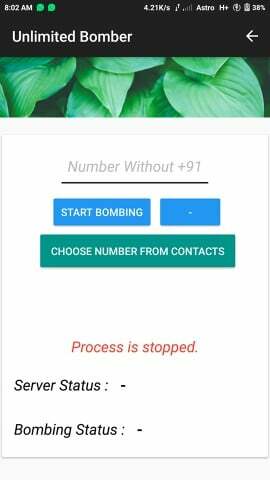 Follow the below-given guide to use the SMS Bomber APK and bomb any Internation Phone Number you want in less than 10 seconds. 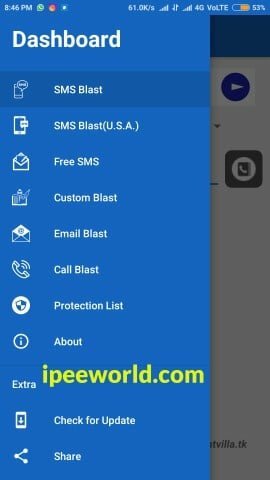 I will leave a link to download the SMS Bomber APK download below. 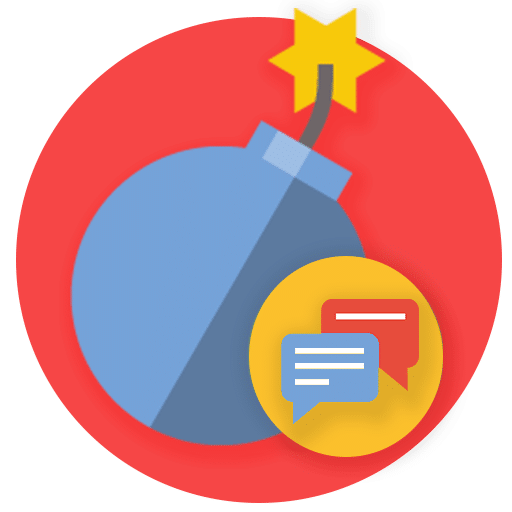 Text Bomb App is the wat method for you if you are actually using an Android Smartphone. By this, you can not only SMS bomb from pc, but also from your smartphone. Firstly, Download the latest version of SMS Bomber from the link mentioned below. During the installation, you might get A Unkwon Source Warning, Just go to settings and Enable App Installation from Unknown Sources. 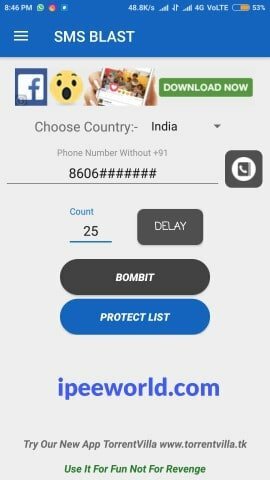 Now, the SMS Bomber App will start sending Messages. To Stop, Just tap the “Stop-Process” button. The above Method works in a way by keeping a limit ratio. This means that you should maintain a frequency to use it. But the step that I am going to discuss further will be of restrictionless. I always love updating the article with latest apps and services whenever I just find a new one. Here, I am adding a second SMS Bomber Application for Android to the list. You can use either one of them, the first one or the second one. It’s completely your choice. The very best thing I like about this app is the Custom SMS option, you will find more about it below. 5. 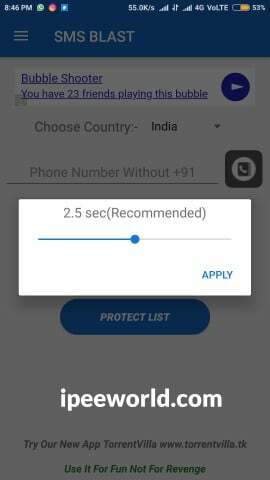 At first, select the country and enter the number without country code in the field provided. 8. Finally, tap on the Protect BOMBIT button and the messages will be automatically be sent. 1. At First, Visit SMS Bomber Page. These are the two best SMS bombing website to do the unlimited bombing. || Update || In the recent update, we have added some alternative sites as well. This will be really helpful when a site doesn’t get it right for you. There are situations where our server hangs up od Down, at these points, you can use the alternative sites to get your job done without any delay. 3. In the Second Box, Enter the count of SMS to be sent. 4. and Finally, Click on the Submit Button. 5. **BOOM** Your Friend will start to Recieve Messages on his/her phone. The number of SMSes he/she receives depends on upon the count you mentioned earlier. The SMS Bomber Application mentioned here in this article is developed by Udit Karode. He is the one who develops the latest version and maintains the App. A big shoutout out to him. He updates the App with new features and bug fixed regularly. So, If a new version of the App comes out, We will definitely update it with all latest info as soon as it gets released officially. Be sure to visit IPEE World for more interesting stuff. This is the easiest way to send Unlimited SMS to your Friend without paying anything. Now your friend’s phone will be a trash of useless Messages. Now He/She will be in Trouble. Developing an SMS Bomber website is not an Easy task, It requires and a lot of time, Coding Skill and much more – Take second to share this Post on your favorite Social Media. You will not use this trick for an illegal purpose. You will not use this trick on some you don’t know personally. We will not take any Responsibility, of anything happened due to this trick. Open Messages on your Phone. Long tap on any Message from where you are getting too many SMS. Click on the Block Button. We have recently noticed that a lot of people are actually misusing this script. 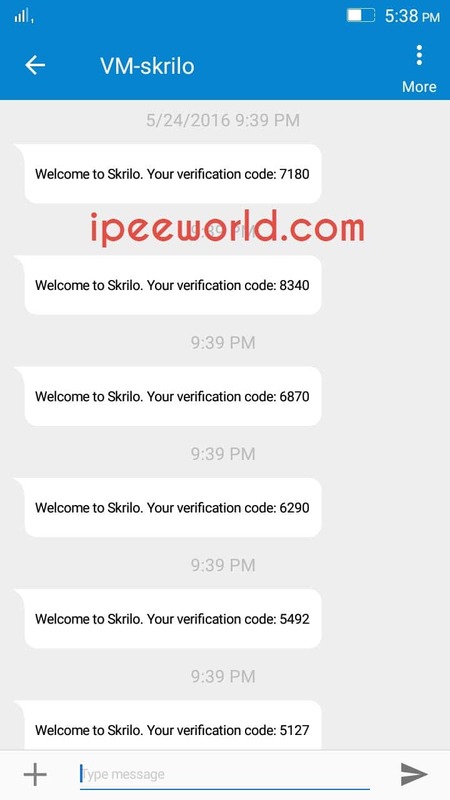 If you guys use these scripts in this page to send SMS to unknown contacts or person you don’t know personally, then you are in great trouble. Author, Admin or IPEE World does not take any responsibility. So, do it at your own risk. Use this script/APK for fun purpose. Hope you guys got it! 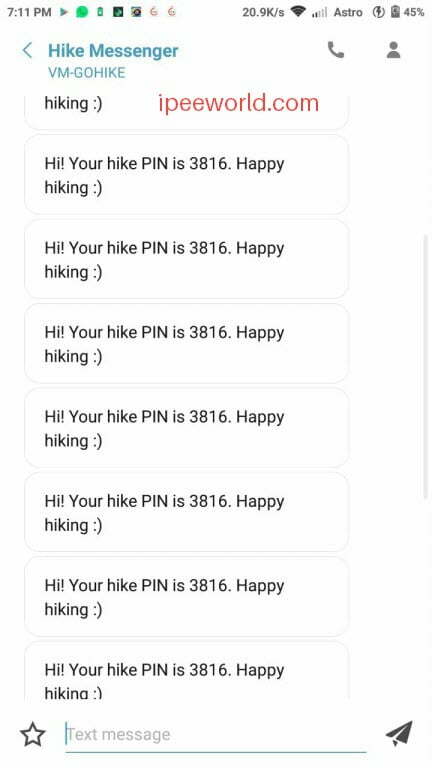 So, Hope you guys enjoyed this Awesome trick to Prank your friend by sending unlimited amount SMS without any technical knowledge. This is our very first SMS Bomber Script we Developed. Now we are currently Developing a MissCall Bomber, which will be Soon Available. This SMS Bomber or SMS Flooder will work with any Mobile number. No matter the service provider, state or anything, This script works with any. Do remember, once you click on the submit button, then the changes are not able to revert. For example, if you type the count as 15, then the SMS will only stop after sending 15 SMS to victims Mobile Number. How cool is it? Be sure to share this script with your friends on Facebook, Twitter, Google Plus or anywhere you like. Comment down below, if you have any doubt or anything, We will catch you at the soonest. 100% Working SMS Bomber and SMS Flooder to send unlimited SMS and prank your friends. Pretty sure my friends will be annoyed once I sent them unlimited text. This happened because of small change the Script API, We have fixed it now. The script seems to be broken again. From what I can tell it seems to be a token issue. Thanks for informing us about the problem. We have updated our Script with new Code and we have changed the API to a new one. Next onwards, it will work for sure. I resubmitted a post to followup about the SMS Bomber not working, and it was deleted? If you don’t want information being submitted about your “apps” not working please fix the problem and communicate with me. Question. …the sms bombing appt…..it’s only good for India networks or entire grid including US? Thank you for your efforts & time developing & sharing with others. Good day. Sir, either version is working. Or is this for only India networks? Try using the SMS Bomber App! Doesn’t work sms bomber I will try 3 times but not working.!! If the 1st one doesn’t get it right for, then go with the second site in the list. does not work. tred both lnks multple tmes. Hey there :3 Developer of the SMS Bomber application mentioned in this post here. Would be better if you posted original link instead of mediafire one, but no probs. Wow Worked like a charm! Thanks a lot for sharing this content with us. SMS Bomber is really different topic.